St. Silouan: When bad thoughts are planted in you . . . This entry was posted in Sayings from Saints, Elders, and Fathers, St. Silouan the Athonite and tagged God as Creator, Habits, Repentance, Suffering, Thoughts on September 12, 2014 by . St. Silouan the Athonite: If the Lord has left us ignorant of the ordering of many things in this world . . . This entry was posted in Sayings from Saints, Elders, and Fathers, St. Silouan the Athonite and tagged Creation, God as Creator, Holy Spirit, Illumining the Mind, Knowing God, Knowledge, Logic/Logical Mind & Thinking, Mind, Spiritual Knowledge on June 10, 2014 by . 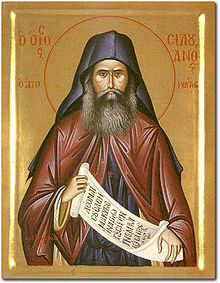 St. Silouan the Athonite: . . . Induce your heart to love your enemies . . . This entry was posted in Sayings from Saints, Elders, and Fathers, St. Silouan the Athonite and tagged Enemies, Evil for Evil, Help from God, Knowing God, Loving Enemies, Prayer, Repentance on January 20, 2014 by . St. Silouan the Athonite: Whoever will not love his enemies . . . This entry was posted in Sayings from Saints, Elders, and Fathers, St. Silouan the Athonite and tagged Children, Enemies, Knowing God, Love, Loving Enemies on January 18, 2014 by . St. Silouan: Christ prayed for those that crucified Him . . . This entry was posted in Sayings from Saints, Elders, and Fathers, St. Silouan the Athonite and tagged Crucifixion, Enemies, Forgiveness, Forgiveness of God, Forgiveness of Others, Judging, Loving Enemies, Repentance, St. Stephen, Suffering, Theosis on December 31, 2013 by . St. Silouan: We must always remember that the Lord sees us wrestling . . . This entry was posted in Sayings from Saints, Elders, and Fathers, St. Silouan the Athonite and tagged Conquering Evil, Courage, Omniscience of God, The Evil One on November 13, 2013 by . St. Silouan: The man who cries out against evil men . . . This entry was posted in Sayings from Saints, Elders, and Fathers, St. Silouan the Athonite and tagged Enemies, Evil, Prayer on October 30, 2013 by .